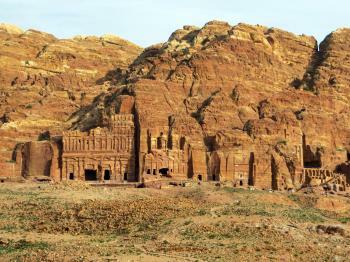 Petra is the archaeological site of an ancient Nabatean city cut into the red sandstone rock. The remains of the city consist of Royal Tombs, obelisks, houses, streets, temples, sacrifical places, a Theatre, a Monastery and the Treasury. It also held an extensive water engineering system. 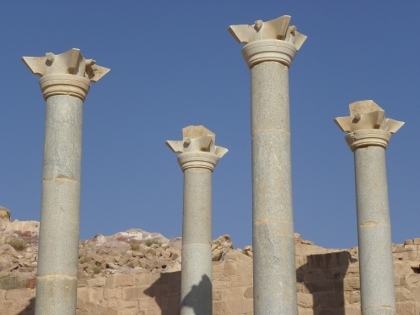 The Nabateans blended ancient Eastern traditions with Hellenistic architecture. The city developed as an important caravan centre between the Dead Sea and the Red Sea. The main developments took place between the first centuries BC and AD. The site moved into obscurity to all but locals from the 7th century on. It was rediscovered in 1812. On its inscription as a World Heritage Site it was described as "one of the most precious cultural properties of man's heritage". • One of the best experiences I found the hike up to the Monastery, and settling myself in a cave right in front of it (across the square and above the café which sells a very refreshing lime & mint juice). Despite the number of visitors, Petra has plenty of spaces were you can roam around on your own or sit quietly and take it all in. • Like all very popular WHS, it attracts a mixed crowd of nationalities and types of visitors. 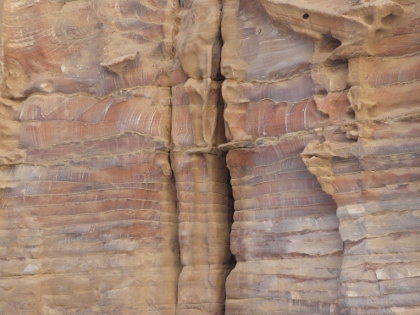 Although one has to do a lot of walking in Petra, more than one woman arrived on impressively high heels. Busloads are shipped directly from the beach resorts at the Red Sea, lots of loud Russians too. I also encountered groups of South Asians, whom I thought to be migrant workers in Jordan or the Gulf (my visit coincided with the Eid holiday). • The number of visitors is actually dwindling since it almost reached the 1 million mark in 2009. It has fallen back to the level of 2007 (about 600,000). It certainly did not feel overly crowded, maybe only the plaza in front of the Treasury is. Both times that I entered via the Siq, one day at 12.30 pm and the next day at 8 a.m., I was able to take photos without any unwanted people in it. • I wasn’t too bothered about the souvenir sellers or the donkey/camel/horse touts . They are not very persistent (Jordanians are pretty sedate in general), and do add a lively atmosphere to the otherwise huge archeological site. In general, I was a tiny little bit disappointed by it. For me the site lacked the real Wow-factor, the excitement that for example Machu Picchu or Angkor have given me. The design of the sculptures and architecture often is Roman or Hellenistic, so pretty familiar. People say that you can spend days in Petra, but I think after 1.5 days (total of 10 hours visiting) I have seen most of it. Only when you would like to explore the hiking trails you can spend more time. *Hums Indiana Jones theme* I was so looking forward to seeing the entrance to the cave to the holy grail! Imagine when I found out that it was all fake - Hollywood you got me again!! Honestly I didn't but I also didn't know that the treasury was off limits and didn't even go far or had anything special inside. The wall is still highly impressive after what was an amazing walk through the canyon, excited to reach it at any moment. The water flow system in the canyon is ingenious. The souvenir stands didn't even offer any Indiana Jones dress up anymore - I guess that time has gone - you can still buy a camel magnet though! Great! I also should have ditched the tour guide. He kept telling the group to stick with him and called people leaving back to the group. The American college girls were right to go for the camel ride straight away and get away from us. The main reason was that with the limited time on this 24h tour from Egypt you only spend a couple hours at Petra; enough to see the main highlights but a little rushed (could have skipped the 1h shopping oops I mean bathroom break). Nobody from the group went up the hill to the additional rock caverns, although I find it impressive enough from the bottom. A masterpiece of design with the rock outcrops, the ruined city is still a wonder and the location was picked for a good reason. Defenses, water supply, caves to keep cool, plus you get Harrison Ford to come by and shoot a movie! 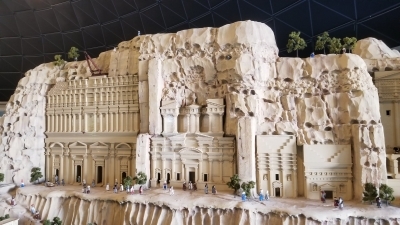 Yes, by now you figured the picture is actually from the Legoland in Dubai ;) I visited Petra in 2016 but I doubt much has changed since then. Way too many peddlers, camel riders annoy you, hot, dusty… but that didn't sour my experience in any way. A must see. It probably goes without saying that Petra is an incredible site - one of the best in the world. I had high expectations before arriving and my visit exceeded them! I spent about 10 hours at the site over just one day. I arrived with a tour group at about 6am and we toured around the main sights together until about 11am. Then I had another five hours on my own. My first recommendation would be to get there early. It was magical arriving really early in the morning before other tourists arrived. Having the walk through the canyon without the crowds and then seeing the treasury (and being able to take photos) with nobody in front of me was incredible. I won't forget it soon! 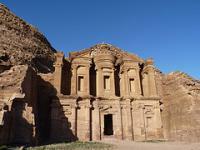 There's a main path through Petra that you can follow and you'll see many of the main landmarks in the central area. There are two other hikes you can do that I would recommend with one day. The first is the hike up to the Monastery - it's just as spectacular as The Treasury and the setting is special in a different way. The other hike is up to the viewpoint high above the Treasury, coming the back way from near the Royal Tombs. The view is beautiful and there are some nice cafes to take a rest. If it helps anyone, I've put together a map and instructions on my blog with these tips of how to visit Petra in one day. I visited Pera at the end of March, and spent a day and a half exploring the site. -wear closed toed shoes! So many little pebbles got in my shoes. -it's much larger than it seems from the outside. Give yourself all day. 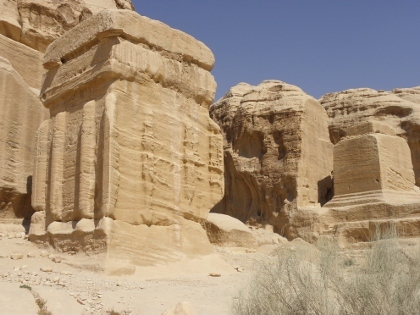 Here's the post on my website with an interview from Jane Taylor, author of "Petra and the Lost Kingdom of the Nabataeans:"
Like many of my age, I suspect, my introduction to Petra was via "Indiana Jones and the Last Crusade", which used the iconic façade of the Treasury to represent a temple housing the legendary Holy Grail. Petra is easily the most recognizable site in Jordan, and was, not surprisingly, the first Jordanian World Heritage Site in 1985. The rock passage through the Siq to this ancient Nabatean city is memorable by day, but even more magnificent during Petra by Night, when the canyon and Treasury are lit up by candles. The ancient music left a bit to be desired for me, but I enjoyed the atmosphere and the shadowy reflections flickering on the rock faces. There is a lot to see in Petra, and long walks are almost guaranteed, unless you take up one of the many offers for camel or donkey rides. I particularly enjoyed the hike to the Monastery at the back of the city, as well as the climb to the High Place of Sacrifice, which offers amazing views of the ancient city below (bring water). At the front entrance to Petra is a museum which provides background on and context for the Nabatean tribes who built the city. Petra does not disappoint! 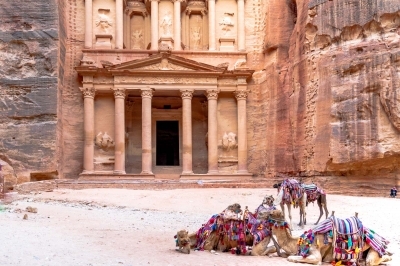 Logistics: Petra may be visited via private transportation, or by day tour from Amman, Jordan, or Aqaba, Israel; I'd recommend staying overnight outside Petra in order to fully appreciate the site. Tickets are also discounted for guests staying at least one night in Jordan. 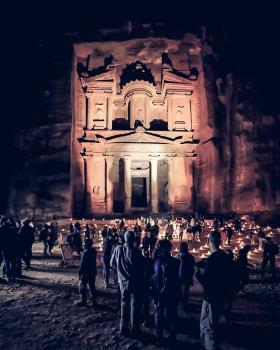 Petra by Night is currently held on Mondays, Wednesdays, and Thursdays. I visited Petra during Christmas holiday in 2014. We drove all of Jordan. During our trip we really could see that the political situation in the area is keeping visitors away as at many places the amount of tourist was not much. Also in Petra we did not feel that it was busy. The site is spectacular. 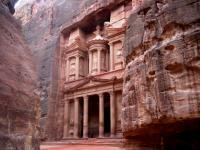 Most people know the treasury view as "Petra" but its so much more. We walked one day all the way to the monastery. and the second day to the high alter. For us this was enough to see the most important things. A must do of course. For photo's kindly see the website. a. Taken in c1923 and scanned in from the book "Wonders of the Past". Ed - J.A Hammerton. Pub - Fleetway. It will have been "hand-coloured". A few Google searches have identified the history of this reconstruction. It turns out to have been done in 1961/2 (just before my first visit in 1964!). 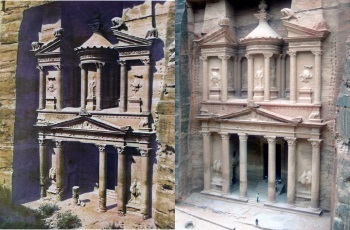 It is interesting to note that the reconstruction was created largely from original fallen elements (in shadow on the left in the earlier photo) whilst the upper part is said to have been "hollowed" to reduce the weight. See photos and description here - http://nabataea.net/trestoration.html. This WHS is one of my favourite and deserves at least 3 full days to get a glimpse of such an immense site. There are several trekking trails to follow and others for you to discover and complete and peaceful solitude. The Treasury from the Siq is jaw-dropping but so is The Monastery (Deir). The colourful rocks close to the public toilets are incredible and the whole archaeological site is huge. Be on the lookout to spot the striking Light Blue Lizard that lives in the valley - really unique. Petra holds a special place in my “travel memory” as, back in 1964, I visited it on my first major “expedition” whilst hitch-hiking from UK to Jerusalem (then in Jordan) and back. Since then I have revisited it 1999 and in 2012. Enormous changes have taken place to the “visit experience” over those years. Many of them are irreversible but that doesn’t mean that they are welcome – the concern now is what the coming years will bring and whether Petra itself can survive and provide a worthwhile visit? In 1964 there was no entrance fee, I just signed in at the police check-point and slept overnight in one of the caves. There were almost no other visitors (though it was low season August) and, on my departure evening, I slept on the floor outside Wadi Musa police station as there wasn’t suitable lodging in what was then a tiny village – happy days! Of course there were no “Lonely Planet” guide books or similar and, although an on-site Archaeologist was helpful, I really saw the site “blind” and, inevitably, missed much of its significance. Visitor information boards had not yet reached the site! So what changes has this massive, and apparently inexorable, increase in visitors brought about? a. Some locations, such as the Treasury and the theatre, have been permanently cordoned off because of erosion problems. Apparently most of the historic “makers marks” on the latter’s masonry disappeared within 10 years. b. The site has lost its feeling of isolation with the village of Um Sayoun now clearly visible on the hillside as one enters from the Treasury. In 1964 Bedouin still lived in and ran their flocks in Petra (I remember a fine camel train but now the only camels are for tourist rides) – they were however removed in the 1980s and they have concentrated in villages close to the site. c. The dreaded “Health and Safety” has made an appearance too! In 1999 we were still able to climb the cliffs behind the Treasury to obtain the fine views they provided. In 2012 there were notices prohibiting this. The entrance to the Monastery climb now has a notice warning that a guide should be taken. One can imagine that it could become obligatory in some locations or that some of the side routes will be closed altogether. But one can perhaps understand the reasons – the terrain is rough and wild. Apparently the search and rescue facilities are not adequate for the number of tourists (many of whom are even older and less mobile than we are!) and the accidents which occur. d. Several striking new “toilet blocks” have appeared - the use of informal latrines by all those tourists can’t have been very pleasant! There was even a “toilet in a cave” (photo!!) where one could sit (or stand!) and look at the carving and the colours of the rocks! I wondered if it might have been this very cave where I had slept all those years ago. The design has been criticized as being “monumental” and apparently the WHC has written twice to Dept of Antiquities asking for their removal. e. Formal restaurants have reached the site. Our day trip from Aqaba included a lunch at one of them. Stylish tented awnings softened the lines of solid buildings and I had high hopes when I noted that it was run by Crowne Plaza, but, in our opinion, the food was less good than one would have hoped for from that brand and we didn’t eat anything! Better to take a picnic and eat wherever you want! f. In 1999 we had entered at 7 am and did find some relative peace and quiet – I would aim to go in at 6am now! Later, everywhere was crowded and “pinch points” like the Treasury were a bun fight. The track up to the Monastery was also a constant stream of people. The “hassle factor” was quite high, albeit in a reasonably friendly manner, but every ruin and every corner on the trail revealed yet another souvenir seller or drinks stall. I know they are only trying to make a living but the site would be more pleasant if the numbers were limited and the locations centralized. Some aspects of the site have improved. The Siq path has been restored (by WMF) to what is thought to have been its original level after centuries of rubble accumulation. It was fully paved in Roman times and this has been left where it was found and, where not, a modern consolidated material has been laid to reduce dust etc. The Byzantine Church, which was only discovered in 1990, has been excavated to uncover its fine mosaics and these have been protected by a shelter. And what further changes can be expected? A problem is that most visitors arrive in the same few hours – apparently a staggered/time stamped ticketing system is under development. Other plans include the introduction of “zones” and a trail system within the site and also the introduction of another exit (the current “need” for everyone to enter and exit through the Siq inevitably reduces the maximum capacity) – and this would need a shuttle service as well. On can imagine a very different visitor experience if these types of changes were introduced. So, improved management might reduce some of today’s negatives – but I wouldn’t bank on it and it would seem likely that a visit in another 5 years would find it even more crowded, touristy and expensive. Still worth it but such a shame! I was in Petra at the end of December and agree it is a place worthy of the designation of a World Heritage Site. What a shame that it is being degraded by the camels, donkeys, touts, bazaars at all levels of the site (with nails even driven into the walls of the ruins), and kids allowed to climb all over the top of the monastery. Come on UNESCO - get on top of the situation and get the Jordanians to take some pride in their site. Any atempt to hype up this site would be futile, so huge, stupendous and icconoic is it. So I won't try I'll just say this one is an absolute must see. Firstly the large tented buffet serves the best felafel I've ever had! Traditionally, you enter Petra through the 1,2 km winding old canyon called The Siq, where the water once carved its way through the red sand stone over thousands of years. The many colors of the Siq has named Petra “Rose city” and the swirls and shades in the stone are just as fantastic as the ancient monuments. After having slowly made your way through the Siq, you catch your first glimpse of The Treasury, a classical view of the most classical of all Petra temples. The amphitheatre and the many other enormous grave monuments are all carved out of the stone and after some further walking you reach the lower town and what was once the Roman area. Here you can relax at the restaurant before you decide whether you head back (4 km) or continue even further…! My recommendation is to allow at least two days to visit Petra. And don’t go there in the summer when the temperature could rise above +40. But once you are there, don’t forget to also include an excursion to the most beautiful desert sceneries you’ve probably ever going to see in your life – Wadi Rum, 2 hours south towards Aqaba – where David Lean once filmed his masterpiece Lawrence of Arabia. I lived in Wadi Musa, the town at the entrance to Petra, in the late 1970s. I worked on a conservation project in the surrounding hills for 2 years. 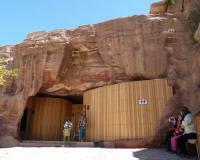 The Bedouins still lived in the caves in Petra, and there were very few tourists. There was only one hotel (I lived in a small flat under the town's minaret...I woke early each day!). I had the good fortune of befriending a Bedouin family in one of the caves (Mohamed had married a New Zelander), and hiking around the exotic sights. I enjoyed the historical, cultural, and local culinary delights very much (mensaf was my favorite, the camel burger was unique but not so appetizing). I look forward to returning after 25 years to see if I can find my old friends, and see how Petra has been preserved. The most famous site in Jordan, this spectacular ancient trading city can be reached through a 90 metre deep canyon in the mountain. The first thing you see after marching through the canyon is the infamous treasury; "el Khazneh" with its mighty colonnades carved right out of the colourful limestone rockface. All around are astonishing temples, burial chambers, stairs, bathhouses, canals and market areas and even a roman amphitheatre with a capacity of thousands of spectators, many of these also carved out of the rockface. In the distance, one can also see Um al-Biyara where spectacular views of the surrounding area can be enjoyed. This being a summer visit, however, the heat got the best of me and I ended my tour at the amphitheatre and sought shelter in the shade of the canyon. Petra was the most unexpected delight and one of my all time favorite places. It was more spectacular than I was expected. A local guide took me thru the gate - before offical opening time (he knew some gaurds - and perhaps some money changed hands). We hiked in the dark to the place of high sacrafice - to see the sunrise over the whole site. After going back down into the city in the valley below I explored the entire site - for hours on my own. I loved the color of the rocks, the remoteness and size of the place - and the general lack of hordes of tourists. Well worth a visit. Aqueduct: "Petra's aqueduct system carried about 40 million liters (12 million gallons) of fresh spring water per day"
The Crusades: Situated in the crusader district of "Oultre Jordain an outpost of the Kingdom of Jerusalem rules by King Baldwin I. Remains of 2 Crusader Castles. One in Wadi Musa may be outside the (undefined?) boundaries of the site but the other, "A smaller fort was built on al-Habis, a high point in heart of the ancient city to complete their signaling sight-line to Jerusalem". Fusion: "outstanding fusion of Hellenistic architecture with Eastern tradition"
Board Games: There is a view that a number of carvings at Petra were "boards" for playing a version of the "sowing" game "Mancala"
Copper production: The Umm al Amad copper mines and underground galleries are an outstanding example of mining structures dating from the fourth millennium BC. Charles Montagu Doughty: During a visit in 1875 to Petra which, by then, was becoming quite well known among travellers Doughty heard of the existence of another as yet unvisited site on the pilgrim route to Medina containing Nabatean remains. Foreigner prices: 50 JD for foreigners that stay at least 1 night in Jordan (otherwise 90 JD). 1 JD for residents!